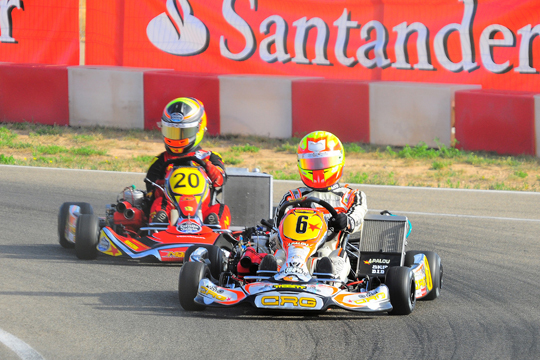 CRG driver Alex Palou Montalbo obtained two podiums in the recent race held in Alcaniz and confirmed himself as the KZ2 Spanish Champion with team M2 Racing Karts. Another national title has been obtained by CRG, this time with the young Spaniard Alex Palou Montalbo who has been the absolute protagonist of the KZ2 Spanish Championship where he has competed with the multiple-times winner CRG chassis pushed by a Modena engine unit run by team M2 Racing Karts. Two podiums in the fourth and last round of the Spanish Championship held in Alcaniz have been enough for the driver to secure the KZ2 title that was already in his hands after the race of Recas. Alex Palou's winning string in Spain started this year in Campillos with a victory and a second place; it then continued in Zuera with a double win, a result that was repeated in Recas-Toledo. He also secured the pole position in Zuera. This is therefore quite a square result that was afterwards strengthened at the Circuit MotorLand Aragona of Alcaniz with two third places in the two KZ2 finals that confirmed his position on top of the classification and gave him the title. Alex Palou has been racing also in KF2 with CRG works team in this season and is at his first experience in KZ2. He increased his prize list with a new title that comes after last year's KF3 WSK Euro Series title, Runner up in the KF3 European Championship, the KF3 Spanish Championship won for two years in a row (2011 and 2012), and the third place in the Cadets Spanish Championship of 2009. In Alcaniz Alex Palou set the second time in qualifying, with a lap that was 82 thousands of a second shy of that posted by the Spanish driver Ugena. He afterwards obtained the second position in the first heat but then a technical inconvenience at the start of the second qualifying heat made him slip down to the tenth place of the Final's starting grid. In the first Final he had to push hard to recover the starting gap, event that gave Palou the chance to shine in a series of overtaking moves that ended up with him in third place. In the second Final Palou fought for top positions throughout and also got the lead of the race in the initial stages but then he contented himself with the third position that gave him the title of champion in the category. 5. Alvarez Ruiz Borja (Intrepid-Parilla) points 185. Alex (on the right) on the podium of Alcaniz, third in Final-1 and in Final-2 (Ph. MRM Comunicacion).